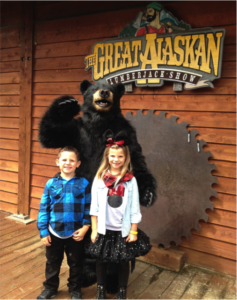 Come enjoy the Great Alaskan Lumberjack Show! The Disney Exclusive Lumberjack Show is a rowdy good time that is filled with quality entertainment for all ages. With kid-friendly activities before the show and special character appearances during, it will sure delight and entertain our Disney guests. Enjoy the rich logging history of Southeast Alaska, as it comes to life in a thrilling display of strength and agility. 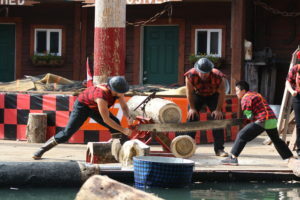 You will have a rip-roaring good time as axes fly through the air, men free fall from tall trees, and then run atop spinning logs floating in the water. This is one hour of World Class Lumberjacks battling it out in chopping, sawing, tree climbing, and axe throwing all wrapped up in history and lore.